Smartly is on a mission to connect learning and skill attainment to positive career outcomes for candidates. The team behind Smartly set out to alter the status quo in higher and professional education. We realized there was a larger issue at hand that needed to be addressed – it’s common for students to spend upwards of and often over $100,000 on a graduate degree without clear career advancement. On the other end of the spectrum, employers are at a loss on how to reach out and acquire talented candidates. Our career network, Smartly Talent, makes the process of hiring and vetting more streamlined and efficient for our partners – leading companies and organizations. We are on a mission to connect learning and skill attainment to positive career outcomes for our candidates. Our Candidates. In Smartly Talent, you will find high-caliber candidates looking for new opportunities. They have studied at elite universities and achieved results at innovative companies. These candidates join our career network, Smartly Talent, when they are admitted into one of our learning programs – world’s first, elite free MBA (2-10 years of work experience), executive MBA (10+ years of experience), and the Smartly Business Certificate (0-2 years of experience). Browse Top Talent: In the “Browse” view, you can filter candidates by office location, role, years of experience, and keywords. When you see a candidate that you are interested in, you can Invite to Connect and send a message to the candidate letting them know what position(s) you are recruiting for. You can also just Like a candidate to request a connection without sending a message. We also give you the option to Share a candidate with a teammate via email or Pass on a candidate that you don’t want to connect with at the moment. Featured Candidates: Our matching algorithm and personalized curation are used to suggest candidates that might be of interest to you. Track Your Candidates: In your Tracker, your interactions with candidates are centralized. You’ll be able to see candidates you’ve connected with, your pending connections, and candidates passed on. Save for Later: You can use our newly introduced “Save for Later” feature to revisit candidate profiles when you’re ready to make a decision. Invite to Connect: When you’re ready to move forward with a candidate, you can use our “Invite to Connect” feature to start the interview process. Hire! : Your first hire is free while we’re still in beta! So sign up or head back to Smartly Talent today to browse our candidates! While Smartly is known for pioneering one-of-a-kind, online MBA & Executive MBA education programs, we also take pride in our budding career network, Smartly Talent. 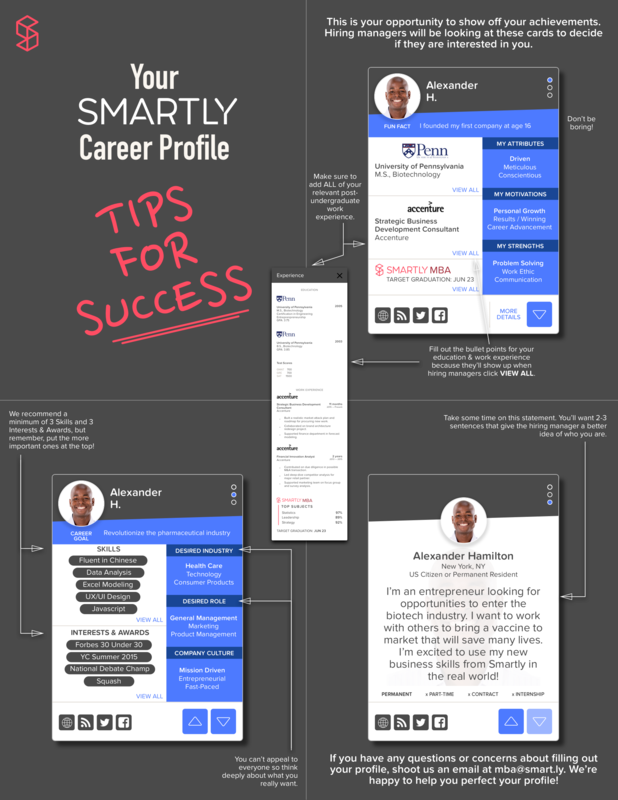 Smartly Talent is designed as an employer first career network, which means that employers browse our candidate profiles and reach out if and when they think there is a fit for their openings. This is our way of closing the loop in the hiring process—we teach you the skills necessary to advance your career, then we help you get hired. Joining Smartly Talent: If you are accepted into the Business Certificate, MBA, and EMBA programs, you are automatically eligible to join our career network, Smartly Talent. Just make sure that you have set your profile to “Active” in the Careers Preferences tab. If you aren’t a Smartly student, you can still apply to join Smartly Talent by applying here. You can find some tips for how to make your profile stand out to employers here. You are liked! : If an employer has expressed interest in your profile, you receive an email prompting them to respond to the employer – you can either like or pass on the employer. It’s a match! : If you like the employer back, the employer receives an email alerting them of the good news! Connect with the Employer: We now have a match and anyone can kick off the conversation to see if it will be a good fit. We recommend starting the conversation as soon as possible! A polite “Hello, nice to meet you! I’m curious to learn more about your open roles” or something similar should jump-start the conversation. Receive Interview Requests: Employers can schedule interview requests with students over Smartly Talent’s messaging platform. Keep in Touch: We realize that everyone’s busy, but if you haven’t heard from an employer in more than a week, we recommend sending another message to check-in! Get Hired! Let us know anytime if we can help you in your career journey. Occasionally, we will share an Employer Spotlight email to support you and our companies by sharing a few of our employers with you, our students, and then proactively suggest viable candidates to those employers. Questions? Feel free to email Smartly Career Services at hiring@smart.ly!